Apologies for the awful pun, but what first sparked my interest in Napoleonic history was visual. I have always been attracted to visual imagery, perhaps that’s why I am such a keen photographer, but specifically with regard to Napoleonic history it was the work in the second half of the 19th century of two French artists, Jean-Louis-Ernest Meissonier (below left) and Jean-Baptiste Édouard Detaille (below right). I remember still, when as a teenager I visited the Musée d’Orsay in Paris for the first time and saw Meissonier’s wonderful painting, below, “1814. 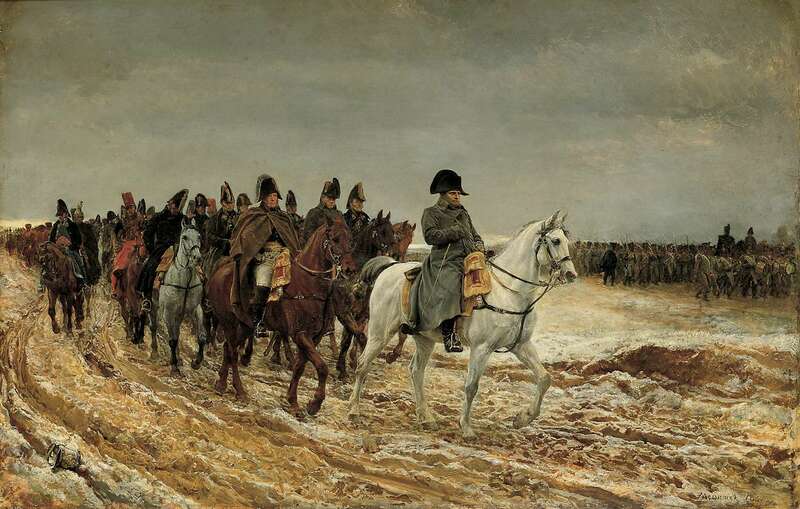 Campagne de France (Napoleon and his staff returning from Soissons after the Battle of Laon)”. 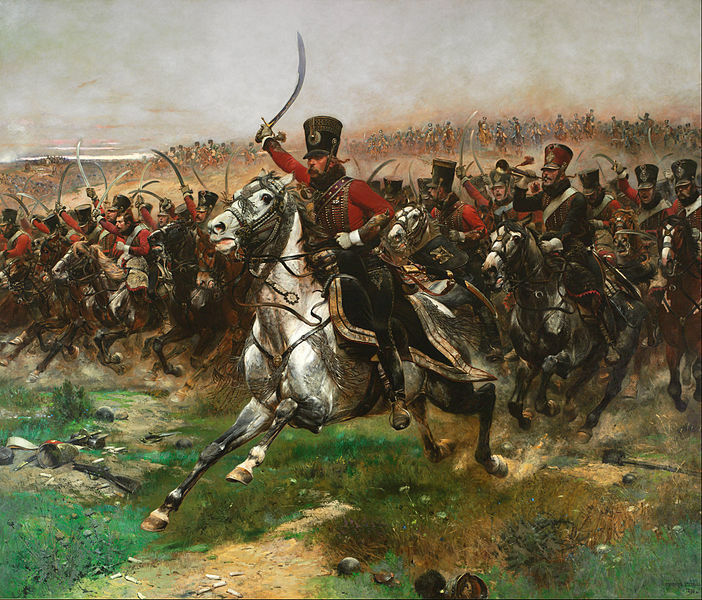 It is full of drama; Napoleon proud and erect (a bit of poetic license there perhaps as Bonaparte was a notoriously poor horseman) despite the defeat his army had just suffered against the Prussians. Behind him his staff ride silently, most so tired they can barely stay upright in their saddles. And all enveloped in a dark and gloomy melancholy (maybe that was the bit that appealed to the teenager). I knew of the painting before I saw it first hand and I remember that I was surprised how small it is – about 76cm by 50cm. But it is filled with realistic detail that is characteristic of Meissonier’s pictures. Indeed, in his own lifetime, Meissonier was acclaimed for his mastery of fine detail and assiduous craftsmanship. 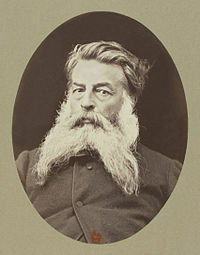 The English art critic John Ruskin examined his work at length under a magnifying glass, “marvelling at Meissonier’s manual dexterity and eye for fascinating minutiae”. 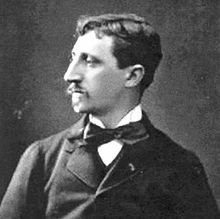 When a seventeen year old aspiring artist, Édouard Detaille, came to him in 1865 to ask for an introduction to Alexandre Cabanel, another renowned artist with whom Meissonier was acquainted, the master looked at the boy’s work and offered to teach him himself. And Detaille turned out to be an eager disciple in the school of obsessive authenticity. He first exhibited at the Salon in Paris in 1867 and from that point didn’t look back. 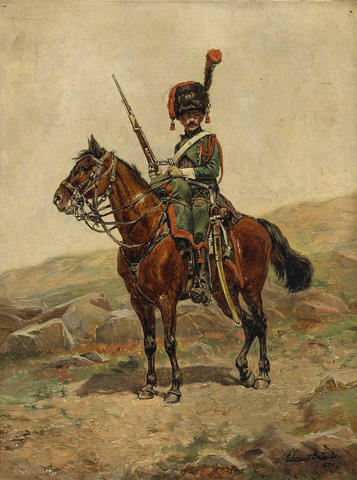 Like his teacher Detaille too was a master of the small canvas, as in this painstakingly detailed picture of a Chasseur of the Imperial Guard. The canvas is just 31cm by 24cm. But occasionally both men splashed out to make big, bold statements on big canvasses. 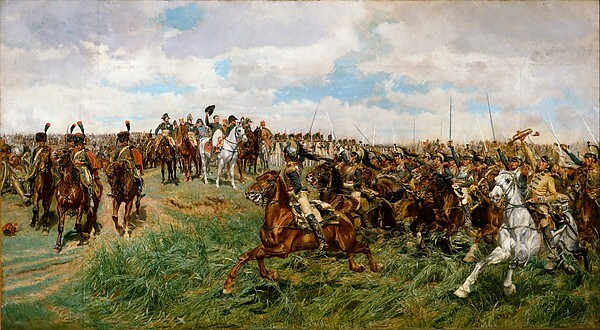 Here are two of my favourites, Meissonier’s “1807, Friedland” and Detaille’s “Vive L’Empereur”. I hope they thrill you as much as they do me.